It is time for all the animals to listen to a bedtime story. They gather, waiting for King Lion to arrive for storytime when Drama Llama shouts ‘Disaster!’ and informs them all that King Lion has lost his voice. There will be no story until he finds it again. What will the animals do? Shy Salamander knows how, but she’s too shy to read aloud. Preposterous Rhinoceros is keen, but there is one problem. He doesn’t know how to make a book work. Do you put on swimming goggles so that you can dive right in? Do you use a key to wind it up? Do you cover yourself in honey so that you can open the book and get stuck in? Nothing Rhinoceros tries works until finally he listens to his shy little friend the Salamander, who helps him learn how to read. 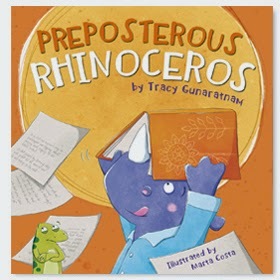 A light-hearted story about reading, Preposterous Rhinoceros will have children giggling with Rhinoceros’ preposterous attempts to force a story from the book. The fun text by Tracy Gunaratnam is complemented by Marta Costa’s bright illustrations featuring a range of animals who enjoy reading together. A lovely bedtime story that celebrates the enjoyment to be found in reading aloud with friends.